Campus policeman Mick Parkes has devised one of the most comprehensive and cunning plans to deal with the issue of bike theft not just on the University of Warwick campus but the University’s whole surrounding area. “This will give us the same tools to deal with bike theft as my colleagues use with car theft. If we stop someone on or near the campus with a bike and if the new database says it’s not registered to you then you better have a really good explanation”. PC Parkes will have special surgeries at which students can bring bikes to be registered at Wednesday lunchtimes in term time - details will be posted on the University’s website next term. 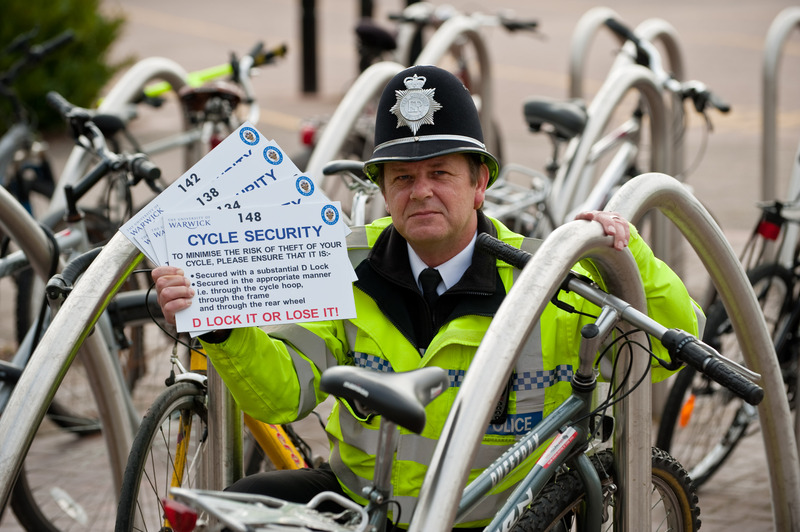 Photo call: There will be an opportunity to photograph PC Parkes with an armful of the new D lock signs at a bike rack at 10am on Monday 22nd of March – photographers should go to University House reception and ask for Peter Dunn.